Do you remember when you got your first sewing machine? How about the second or third? Even for those of us who’ve acquired several machines over the years, “meeting” each one is just as exciting as the first. Kimberly Einmo (you may have seen her “Magical Jelly Roll Quilts” and “Chain of Stars” classes on Craftsy) sent this story about her newest machine. 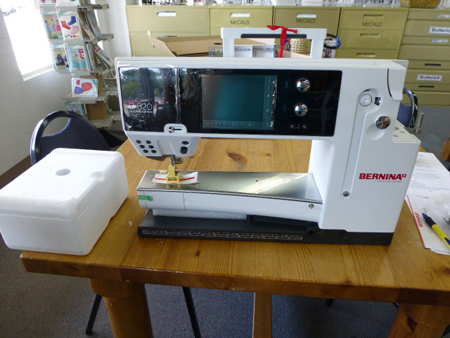 I’ve always loved BERNINA sewing machines, and I’ve been wanting to purchase a new BERNINA for quite awhile. Due to a number of reasons in the past few years it just hadn’t been feasible. However, after a recent trip to Paducah for AQS Quiltweek in April, I finally decided I needed to jump in with both feet and just make it happen. I called Jeannie Delpit and shared my happy decision with her and discussed options, including which machine would be perfect for me. Jeannie (who is a breath of fresh air and sunshine all in one!) was happy to help me make this a reality. 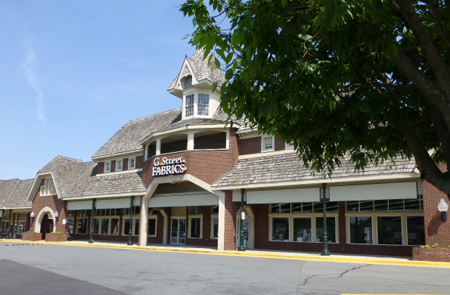 Since my family and I had recently relocated to the Washington, DC metro area, the first thing she did was suggest a number of wonderful BERNINA stores in the area. I did my research online at the BERNINA website to compare machine models and features and with her help, decided the BERNINA 820 QE was going to be the best fit for me. My sweet husband gets much of the credit too, because he surprised me during a Friday date night by telling me to just “go ahead and order the machine right away.” What a wonderful guy! 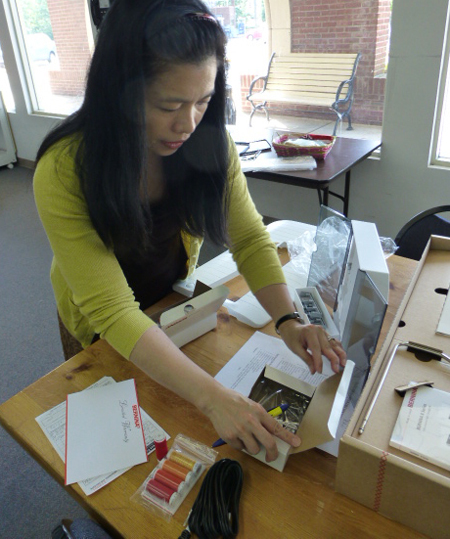 Jeannie put me in touch with Mei-Ling Huang, at G Street Fabrics in Centreville, VA, and I ordered the 820 through her. It took less than two weeks before the machine came in and you can bet as soon as she called to let me know it had arrived, I made an appointment to meet with her that same afternoon. Mei-Ling was so sweet and gracious, and only too happy to set aside a three-hour time slot to give me one-on-one, personal attention and instruct me in my first new machine owner’s class. Honestly, I have to say that’s one of the best things about BERNINA and their dealers: they are truly committed to personal attention and outstanding customer service! 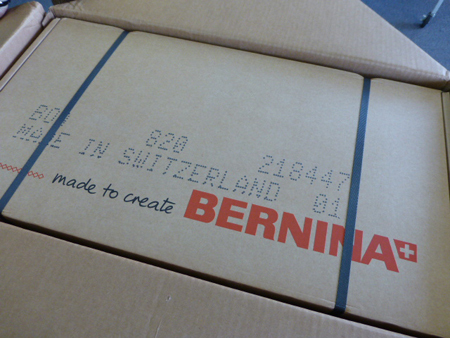 A new BERNINA 820, awaiting Kimberly’s arrival. When I walked into the store, the box was waiting for me. (Ordinarily, Mei-Ling would have had the machine already unpacked and set up, ready to go. 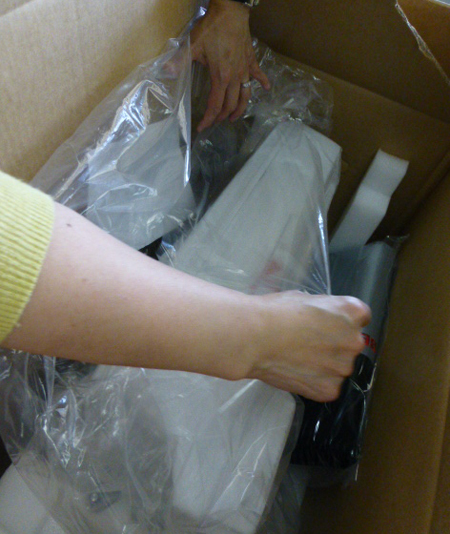 But at my special request, she waited to open the box while I was there so I could see just how the machine was packed for shipping.) 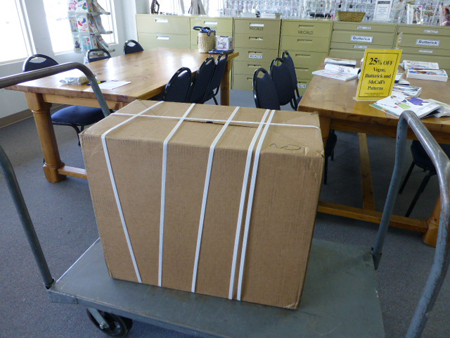 I took lots of pictures just in case I ever need to pack it for shipping. Considering our military background and the number of times we’ve moved our household in the past 24 years, this was an essential step so I will remember how to do it properly. 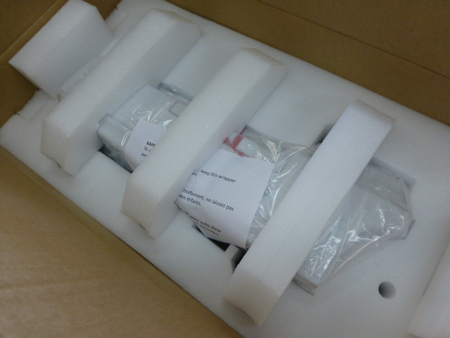 The box inside the box. 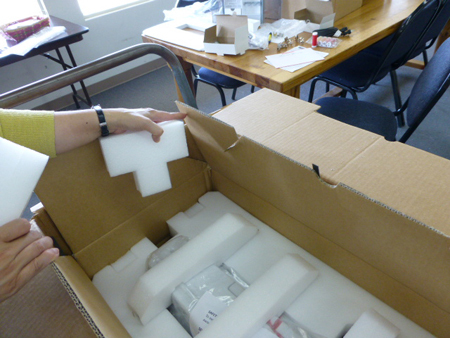 A network of protective interlocking foam inserts. Under all the foam, the machine is wrapped in plastic. Mei-Ling carefully checked off each accessory as it came out of the box. She even took care of registering the machine’s warranty. It felt like Christmas going through each and every item! 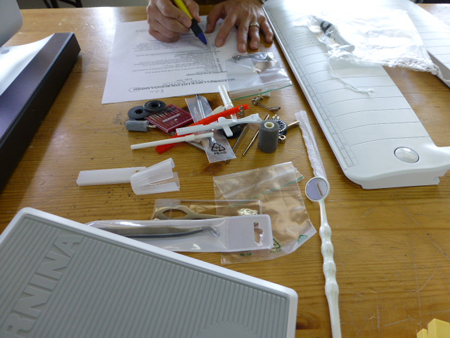 More accessories, accessory cabinet, warranty card, and even a pack of thread! As I always tell my students, it is so important to establish a good rapport with your local sewing machine dealer from the very beginning. You are not simply purchasing a new sewing machine. You are establishing a relationship with a dealer who will be there to help you, give instructions, answer questions, and provide outstanding service to you and for your machine through the years. That’s why its essential to find a machine that meets your particular needs, fits your budget, and a dealer who will take care of you AND your machine from day one and into the future. 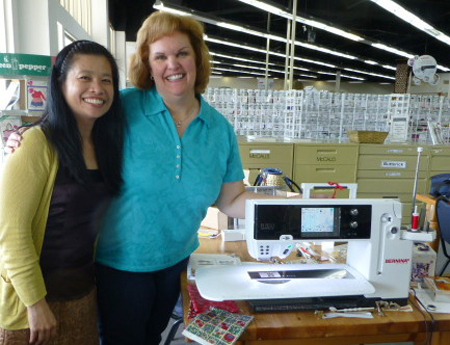 Needless to say, I spent an informative yet fun-filled afternoon getting know my new BERNINA 820 and Mei-Ling and her staff. Looks like the beginning of a beautiful friendship! Kimberly Einmo is an AQS author, international quilting instructor and quilt judge. Her books include Quilt A Travel Souvenir, Jelly Roll Quilts & More, Jelly Roll Quilt Magic, and Precut Bonanza. She has written numerous magazine articles and developed a signature line of tools including the EZ Flying Geese Ruler, the EZ Jelly Roll Ruler, the EZ Hearts Cut Tool, and the EZ Pineapple Ruler. 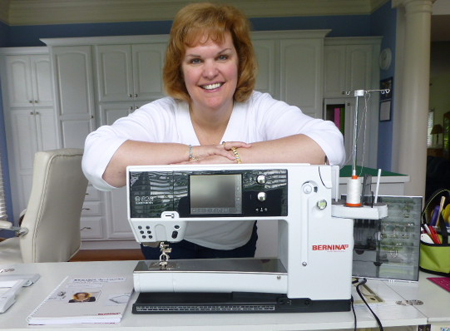 Kimberly also has two very successful online video classes on CRAFTSY.com and is very proud to be a BERNINA Ambassador.